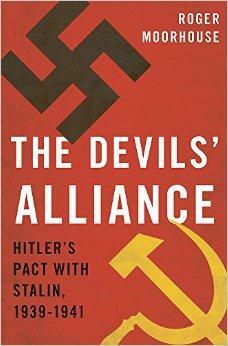 A review of The Devils’ Alliance: Hitler’s Pact with Stalin, 1939-1941 by IWP student and researcher for the Kosciuszko Chair of Polish Studies Pawel Styrna was published by the Selous Foundatino for Public Policy Research. A portion of his review appears below, and the full version can be found here. On the night of August 22-23, 1939, in Moscow, leaders of two of the most evil totalitarian regimes of the twentieth century — the Third German Reich and the Union of Soviet Socialist Republics — signed the Nazi-Soviet Pact, also known as the Ribbentrop-Molotov Pact. Officially a “non-aggression” pact, the Hitler-Stalin agreement was a Machiavellian partition of Poland and Central and Eastern Europe (i.e. the Intermarium) between the Germans and the Soviets, the former claiming western-central Poland and Lithuania, and the latter seizing eastern Poland, Latvia, Estonia, Finland, and a slice of eastern Romania (Bessarabia). The two sides swapped central Poland for Lithuania a month later, after destroying Poland. Stalin thus gave Hitler — who was uneasy about the prospect of a two-front war — the “green light” to invade Poland and thereby launch the Second World War. What resulted was a de facto alliance of almost two-years that helped both the Nazis and the Bolsheviks achieve many of their aggressive and blood-thirsty aims. Of course, this Machiavellian arrangement collapsed when one party (the Germans) attacked the other (the Soviets) on June 22, 1941, but — as British historian Roger Moorhouse emphasizes in his most-aptly-titled Devils’ Alliance — the destructive effects of the Ribbentrop-Molotov pact were by no means voided and reversed: the extermination of the Polish and Baltic elites and the defeat of France remained faits accomplis, and the Soviets continued to claim the lands they had gobbled up under the “devils’ alliance.” Unfortunately, few in the West appreciate the pact’s significance. This entry was posted in Uncategorized on May 1, 2015 by IWP.